or with a rolling pin, then mix into the base sauce. 2. Stir in the Rustic Rogan Josh sauce then brush half of it over the lamb. Cook the lamb under a preheated grill or barbecue for 6–8 minutes, turning once or twice and basting with the remaining sauce until nicely browned but still a little pink in the centre. Transfer to a warm plate and leave to rest for 5 minutes. 3. Meanwhile, toss together the chick peas, watercress, salad onions, olive oil, red wine vinegar and cumin seeds. Divide the salad and lamb steaks between 4 plates. bowl. 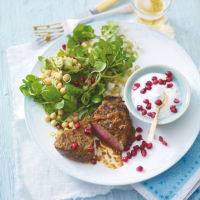 Scatter over the pomegranate seeds and serve alongside the lamb and salad. If the sun is shining, try cooking this on the barbecue. Or to make party kebabs, cut the steaks into thin strips, thread onto skewers and grill for 2–3 minutes on each side until nicely browned and cooked through. Serve with the yogurt dip. This recipe was first published in Tue Jun 18 12:14:00 BST 2013.